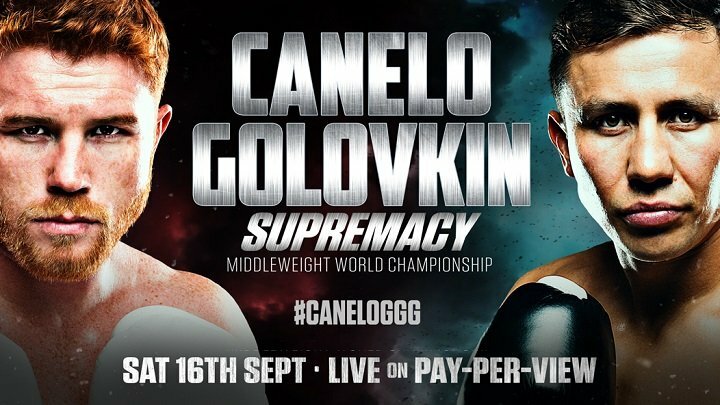 By Allan Fox: Former multi-weight world champion Juan Manuel Marquez is picking Saul “Canelo” Alvarez (49-1-1, 34 KOs) to send unbeaten middleweight champion Gennady “GGG” Golovkin (37-0, 33 KOs) down to his first career defeat on September 16 in their fight on HBO PPV. The recently retired Marquez likes Canelo’s hand speed, power, counter punching ability and overall boxing skills as being the key to him beating the 35-year-old IBF/IBO/WBA/WBC 160 lb. champion Golovkin. Marquez is picking Canelo, 27, to beat Golovkin by a decision. Marquez isn’t going out on the limb to predict a knockout for Canelo, because that’s pretty unlikely. To knockout Golovkin, Canelo would need to throw sustained combinations for a long period of time. That’s how Canelo usually gets his knockouts when he’s not facing vulnerable opposition like Liam Smith, Amir Khan and James Kirkland. Canelo was unable to knockout Erislandy Lara, Austin Trout and Miguel Cotto. If Canelo couldn’t knockout those guys, then it’s going to be next to impossible for him to KO GGG. “I think the fight will be a great fight,” said Marquez to Fighthub in discussing the Canelo-GGG fight. ”Canelo has the perfect style to win the fight, but I think Gennady Golovkin is a dangerous fighter. He has power, he has his strength, and I think it will be a great fight but I think Canelo will win the fight,” said Marquez. It’s nice that Marquez is going with Canelo to win the fight, but he’s still the underdog, weaker and much smaller than Golovkin. When you get two good fighters and put them in with each other, the bigger and stronger guy usually wins the fight. Obviously, there are things that you have to factor in like the judging. If Canelo gets the kind of judging that he had in his wins over Erislandy Lara and Austin trout, then it won’t matter what Golovkin does. He’ll lose the fight if he doesn’t knock Canelo out. That’s the main reason why Golovkin’s trainer wants him to KO Canelo. He doesn’t trust that Golovkin will be given a decision over the most fighter in boxing right now. Canelo has the speed and the boxing IQ to win a decision over Golovkin if the fight takes place in a phone booth type battle. If Golovkin decides he wants to trade with Canelo like he did against Willie Monroe Jr. and Kell Brook, it means he could lose if he takes more shots than he dishes out. It would require that Canelo get out of the way of Golovkin’s best shots, and fight at a sustained rate for the full 12 round fight. If Canelo gets tired and needs to fight off the ropes, this fight could end quickly with Golovkin unloading on him with body shots. It would be stupid if Canelo fights off the ropes. He should know by now that he can’t do that against Golovkin if he wants to beat him. Canelo must will himself to stay in the center of the ring and box Golovkin instead of fighting like Floyd Mayweather Jr. against the ropes. Canelo will never be like Mayweather. If Canelo fights like that against Golovkin, Danny Jacobs and Jermall Charlo, he could fail at the middleweight level. Canelo was able to get away with fighting that way when he was fighting at 154 and at 155 against opposition picked out by his promoters at Golden Boy, but he needs to fight much different now that he’s at 160 against fighters like Golovkin. I think many boxing fans would disagree with Marquez with him saying that Canelo has the power. He doesn’t have more power than Golovkin. Canelo has enough power, speed and counter punching ability to beat Golovkin if he gets in a war with him. That’s only if Canelo can take Golovkin’s power. We don’t know yet whether Canelo will be able to take Golovkin’s power for the full 12 rounds. If Canelo uses a lot of head movement, Golovkin will certainly start targeting his midsection. Canelo won’t be able to get out of the way of all of the body shots that Golovkin hits him with. If Canelo drops his gloves to guard his body the way that Kell Brook did in round 5 of the GGG-Brook fight last year, then Golovkin will bring his punches back upstairs and start nailing him with head shots. Marquez did not say anything about what Canelo will do to nullify Golovkin’s jab. Canelo has never shown the ability to shut down an opponent’s jab. Miguel Cotto, Floyd Mayweather Jr., Austin Trout and Erislandy Lara all had great success hitting Canelo with their jabs in their fights with him. Canelo couldn’t do much. He didn’t have the arm length to jab with them, and he couldn’t avoid all the jabs that were thrown at him. Using head movement is good, but it won’t help a fighter avoid constant jabs. Canelo will probably choose to lean away from Golovkin when he attacks him with jabs. ESPN commentator Teddy Atlas noticed that Canelo likes to lean straight back when his opponents target his head. Canelo’s habit of leaning backwards opens up his body to get hit, as well as his head. If Golovkin steps forward each time Canelo leans backwards, he can nail him with head shots and hurt him. Canelo would be better off keeping his guard up and not leaning away from the shots so much. Golovkin will obviously have several game plans that he’ll be suing against Canelo based on the different things he does inside the ring. If Golovkin is having problems with the things that Canelo is doing, he’ll switch it up and try different things. If Golovkin starts out jabbing Canelo like he did against David Lemieux and Danny Jacobs, then it could be a long night for the redheaded Mexican star. He’ll find it very difficult to deal with Golovkin’s power jabs because he throws it straight like a power punch. Golovkin leans into those shots, and it makes them a lot harder than a usual jab. Canelo’s hand speed, heavy hands and combination punching will give Golovkin a great deal of problems at times in this fight. If Golovkin nullifies Canelo’s left hook and uppercuts, then he’s going to force the Mexican fighter to beat him with right hands. That’s a losing proposition for Canelo. His right hand isn’t strong enough for him to beat Golovkin in a war. Canelo needs the pace to be slow for him to win. If Canelo has to fight quickly, he’ll lose the power on his shots and he’ll take a beating from Golovkin. It’s going to be tough for Canelo to win either way. He can’t stand in front of Golovkin trying to load up, and he won’t be able to beat him if his shots are thrown in a hurry without power. Canelo will need to get the better of Golovkin in the exchanges, and then get away from him before he’s able to land his own power punches. Canelo should be able to dominate Golovkin when the two of them let their hands go. Canelo’s punches will get there first, and he’ll be able to score with his counter punches.